last day & no more slot for men? oh no! I got lucky catching the last day of registration for the Nike We Run Manila 10K 2011 at Nike Park Bonifacio High Street. But not my hubby though. The men's category closed a day earlier than the women's category, about six days earlier than the published registration period. Good thing I found another female who's looking for a "buddy" so we adopted each other as buddy and we both saved some cash in the registration fee. 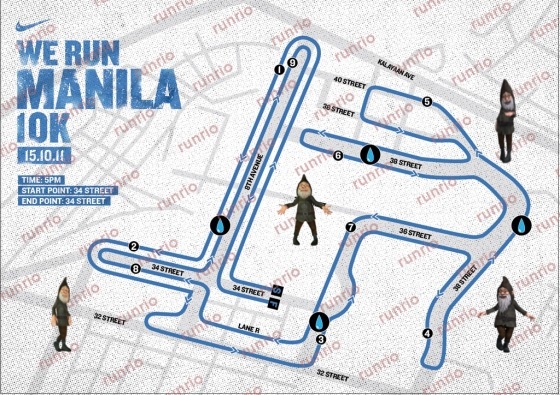 After excitedly looking at the pictures of the race kit items which includes a Nike Dri-fit Tee, Nike Water Bottle and the specially-designed USB Flash Drive for finishers, I studied the race map and laughed at myself. "IT’S YOUR CITY. RUN IT." NIKE We Run Manila 10K 2011 – Is a 10k night run that will happen on October 15 and will take the runners traversing the heart of the city’s rising business and lifestyle district – Fort Bonifacio Global City in Taguig. The race is part of the Nike We Run City 10k races happening in multiple cities such as Seoul (South Korea), Monterrey (Mexico) and Santiago (Chile) that promises a unique run experience combining running and music. Funny I got lost in this "city" twice. They were on two separate incidents and with two different friends on the wheel. The first time was when we are on our way to attend a necrological service in Santuario De San Antonio Parish. We overshoot from EDSA and ended up in Bonifacio Global City (BGC). After several rounds we can't find our way back to McKinley Road. My friend who's driving was so embarrass that we're so lost . We reached just in time the service is just about to start and my cell phone is clogged with "wer na u?" (where are you now?) messages from other friends who's already in Santuario. The second time was when we visited a friend confined at St. Lukes Medical Center Global City. My friend is driving me home and made one wrong turn and we're lost. And same thing happened, we were so lost for several rounds before we found the right route to our destination. As I excitedly anticipate exploring this city by running, I have this crazy thoughts that gnomes would be so busy during the race day. I'm just not sure if their powers can handle eight thousand runners. Hmn... let us see. Who knows they might end up running wearing the Nike dri-fit tee. Funny! Will they be messing our route or will they be running wearing a dri-fit Nike Tee?"